For many, the best memorial tribute to a loved one is their photograph etched in stone for a permanent and lasting reminder of their life and love. Laser engraved photo cremation urns are a great option for many families, because the premium-quality cremation urn includes personalization and has a relatively affordable price compared to many custom made memorials. Our Engraved Photo Granite Cremation Urns provide the ideal canvas for a laser etched photo memorial. The black granite urn is beautifully designed and constructed to endure, with simple lines which allow the viewer's eye to be drawn towards the laser engraved photo and inscription. The photo engraving process is set up by professional graphics artists who will crop and enhance the image you provide to provide the best possible picture of your loved one. Good portrait photos provided in a high-resolution image file (such as JPG or PDF) work best; however, our talented engravers will make magic happen out of most decent-quality photos. Just remember, the better the original image with which we are provided, the better the resulting photo memorial. You can choose the layout of the photo (left, center, right) as well as whether you want the background cropped out or retained. Also included is personalized text, most often the individual's name, their dates of birth and death, and a brief epitaph inscription, such as "Our lives are brighter for having known you." The urn itself is cast and molded using cultured granite, a resin-based material similar to many modern countertops. This allows the urn to be created without seams, with a bottom-opening sealed gasket and spacious 210 cubic inch capacity. The solid and durable urn is 5/8" thick all the way around, with a "fail-safe" urn liner and tiered structural reinforcement system. 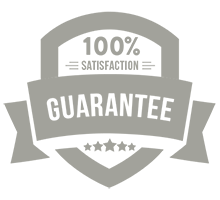 As a man-made product, our black cultured granite urn is much more affordable than true granite while effortlessly conveying the quality and durability of the real thing. The coloration is flecked with white, and the laser engraved personalization of photo and text reveals a brilliant white which perfectly contrasts with the deep black granite urn surface. We also have a slightly smaller version of our engraved photo granite urn, which is designed for pets. This classy custom pet urn is the same design as the standard sized urn above, but with decreased dimensions which hold 100 cubic inches. This will hold the cremated remains of a pet weighing up to roughly 100 lbs, so it is ideal for most dogs, cats, and other household pets. Whatever you would like engraved onto the photo urn, we can help you make it happen. 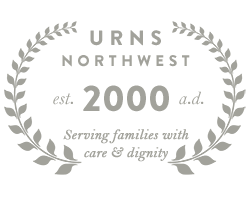 Let us know how you would like to customize the photo memorial and we will work with you over the phone (877-900-5309, M-F 8:00am-5:00pm PST) or via email (info@urnsnw.com) to make your custom engraved photo urn a reality.